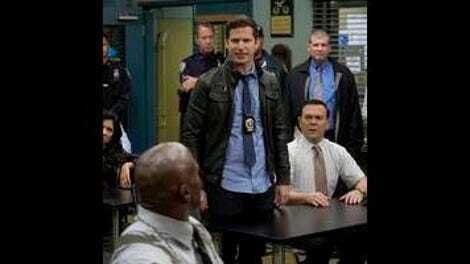 Previously on Brooklyn Nine-Nine: The Nine-Nine is in trouble, thanks to an unstable ex. This week on Brooklyn Nine-Nine: The Nine-Nine is still trouble, thanks to an unstable ex. The difference? Well, this week’s cold open doesn’t inspire as much confidence for the rest of the episode as last week’s did… However, in this episode’s defense, it would have been impossible for it to duplicate the same type of pained hilarity that was Gina and her halo. The immediate reminder of Veronica Hopkins’ personal vendetta against the Nine-Nine isn’t a good opening look for the episode though. But it at least ends up being an outlier for the episode, as “Serve & Protect” isn’t just “The Audit, Part Two.” In fact, this episode steps away from the shenanigans of “The Audit,” though it’s still focused on the Nine-Nine preventing a gross abuse of authority. The thing about this week’s gross abuse of authority is that it’s just one bit of frustration in an episode full of the type of casual corruption these characters are always going to have to encounter. 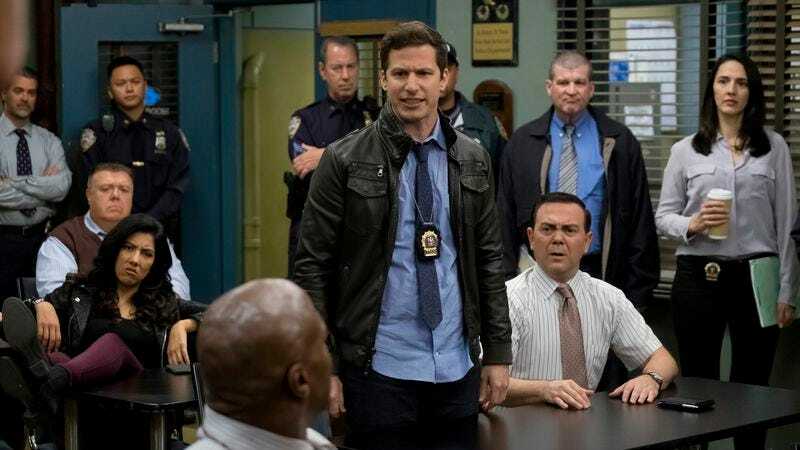 I’ve written before how Brooklyn Nine-Nine is ultimately about optimism in a setting that rarely inspires such a thing, and while last week’s episode leaned hard into the wackiness of the audit situation, this episode is more a reminder of how the Nine-Nine’s world isn’t just fun antics. That casual corruption isn’t just in an impartial auditor; it’s in Boyle and Holt’s initial plan to go over Veronica’s head to fix things; it’s even in Boyle and Holt’s decision to blackmail the philandering deputy commissioner (and in them spotting that in the first place); it’s in Jake’s ability to easily be charmed by the cast and crew of Serve & Protect. It’s also in whatever the Nine-Nine probably has to do to reverse any decisions caused by the very negative review (“It was real bad.”) Veronica sent in for them. These are a bunch of cops, but absolutely no one in this episode is saying they’re paragons of virtue—even when they’re planning to do something shady for a good reason. Obviously, the chances of Terry having intentionally done something awful to Veronica back in the day were always slim to none, but it’s good to see this episode confirm that. And because this is Brooklyn Nine-Nine and Terry, I have no problem believing the restaurant truly did applaud the break-up. There’s also such a great joy that comes from Gina and Amy’s joint interrogation of Terry, since we know how cold-blooded Gina can be (she calls him a “stupid liar” and destroys precious yogurt). She’s so focused here that she doesn’t even take the time to mock Amy. That’s commitment. Surprisingly, this plot isn’t the one that really goes for the emotional beat, and whatever Veronica’s state of mind is in this episode, it’s all offscreen. But Jake and Rosa bring it all home with a story about friendship, which could possibly be the truest victim of this potential shutdown. It should be acknowledged that the Jake/Rosa plot as a whole is really driven by Andy Samberg and Stephanie Beatriz’s back and forth in their dueling approaches to the case (and a little bit of their mutual exasperation with Nathan Fillion’s blowhard Mark Devereaux). The Serve & Protect backdrop unfortunately (especially since Michael Schur returned to direct this episode) doesn’t bring anything new to the strangers in a strange land plot of non-“Hollywood” types on a “Hollywood” set (in New York), and the plot itself somewhat loses the thread of Jake attempting to cheer Rosa up with this case in the first place. But there is some really good stuff out of a cop, like Jake gleefully thinking he belongs in the acting world, while an actor like Mark Devereaux thinks he’s basically a cop. (At least Jake and Rosa can agree on the Mark thing: He’s not.) Also, Jake makes a subprime mortgage crisis joke, which is just so out of left field it sticks with you. This is a relatively light case, which makes way for the emotional aspect of Rosa’s feelings about the Nine-Nine possibly being shut down. Sure, the episode opens with her taking out her frustrations on a printer, but that could just be any day at the Nine-Nine. It’s a nice choice for Rosa to worry about the crew no longer being friends if they’re all scattered, especially as it builds off Jake’s jokey worries from last week that he and Amy would probably break up (because he’s like a goldfish); it’s a stressful time, and as everyone’s running around to fix things, they’re not really talking about this. But Jake is also right in how he tells her they’ll still be friends—and not in the corny way the Serve & Protect PA says the cast and crew are like a “family”—for no other reason than… well, look at this episode. And last week’s episode. The precinct is only even in this mess because these goofs can’t function without each other, often to the detriment of outsiders. Friends forever. But the true crown jewel of this episode comes in the form of the Boyle/Holt plot, which just feels great to say, as surprising it is. Boyle/Holt is still one of those Brooklyn Nine-Nine dynamics that can be more miss than hit: Boyle tends to be at his most subservient in these situations, while Holt at his most authoritarian. This week, Boyle and Holt have the closest thing they’ve possibly ever had to a team-up like Jake and Holt have had plenty of times before, and it works. Holt still finds Boyle’s awkwardness unprofessional in the appropriate cases (like in the cold open or in the request for a “bathroom conversation”), but he also actually listens to Boyle’s suggestions… and Boyle stands behind them without faltering. In the same scene, Boyle has no problem confirming that he’s been dumped 210 times (after originally miscalculating it to six times, without considering exes who “just want to be friends”) but also finds some sense of awareness when he walks back his Desperate Housewives line. That’s an awareness he regularly lacks, but in this moment, he finally shows his ability to determine what might not land with his boss. Luckily, Boyle’s ideas in this episode land with Holt almost immediately. And as questionable as it may be on an ethical level, in theory, it is a good idea to go over Veronica’s head and straight to the deputy commissioner about this audit. They already had one auditor recuse himself, and while this episode doesn’t quite address it, I can only imagine if they’d had their second auditor recuse herself, that would look worse for the precinct than anything else. Because of Boyle’s initiative in this episode—and Holt’s willingness to go along with it—they end up discovering something that can actually help them: Deputy Commissioner Grayson in the Poconos with his mistress. Boyle and Holt probably “should’ve” gone through with the blackmail to wrap this all up, but that’s not them. At least not without personal provocation; as rude as the deputy commissioner is to them, it’s mostly the result of them being very odd around him. Their integrity intact and this storyline still in progress, even with the lesson of the week, we get some really good bits from Boyle and Holt in this episode. No one can ever take away their blackmail preparation scene. So now that the exes are out of the way, it’ll be interesting to see how the rest of this storyline shakes out with the Nine-Nine. Obviously they got a really bad review from Veronica, but at the same time, everything we know about Brooklyn Nine-Nine—from just this episode alone—means they can’t possibly be the only precinct to get a negative review. This week in webisodes Brooklyn Nine-Nine needs: I think I’ve honestly seen enough Serve & Protect to hold myself over (“34 double dead” is certainly a line), but I could go for a Girl Talk: Do’s And Don’ts from Gina and Amy.